Everyone I talk to agrees that men are the most difficult people to buy holiday gifts for! Whether it’s a boyfriend/husband, brother, dad, or a male friend I always find it impossible. Their vague wish lists never make it any easier either. After being with my husband for about seven years, I think I finally understand what a stylish guy wants. That is only one subset of the male species but I’m happy that I can shop for men who are interested in fashion and stylish pieces. My husband loves clothing, shoes, and is all about his hair. While some people find it “weird” for men to care about their appearance or be interested in fashion or skincare, it is something I really admire about my husband. I thought he looked so stylish and trendy and he obviously took care of himself. It was part of the reason I was attracted to him, (also the fact that he’s 6’5) #winning. These are gifts I know he would love and they are from stores that he shops at. 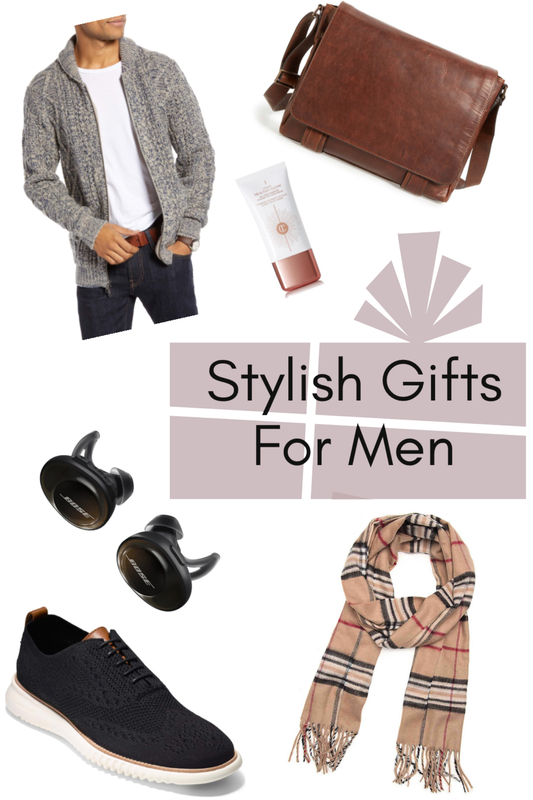 I put together this gift guide for those of you asking what to get for the metro stylish men in your life! A quality messenger bag- The Frye ‘Logan’ Messenger Bag is the perfect size to fit a laptop and any accessories and products your stylish man may need throughout his day. I’m a firm believer that a purse makes life easier and men should definitely have their version of a purse. A Trendy Sweater- A stylish sweater is a must-have staple in everyone’s closet. This Patch Cable Knit Crew Neck Sweater from Express is so flattering and would make a great stylish Christmas gift. A classic plaid scarf- Another trendy staple for this time of year. The V. Fraas Plaid Scarf is also a great Burberry dupe! Hair styling products- My husband loves experimenting with his hair so a variety pack of different styling products is a great gift. The Fatboy Essential Collection includes a pomade, putty, wax, and soap. Fashionable shoes- These Cole Haan water-resistant knit shoes are just so cool! My husband tries not to buy expensive things very often, but he will splurge on a pair of Cole Haans. Skincare- Everyone needs a good skin care regiment and if your man wants to even out his skin a bit then the Charlotte Tilbury Unisex Tinted Moisturizer is perfect.